This is my 1st time posting here as I haven't found a solution anywhere else. Yesterday I have updated my Reshade version to 4.0.2. My previous version was just before this new update. And since this new version, my LUT shader doesn't have effect anymore... I have of course tried to modify the setting of this shader but nothing. 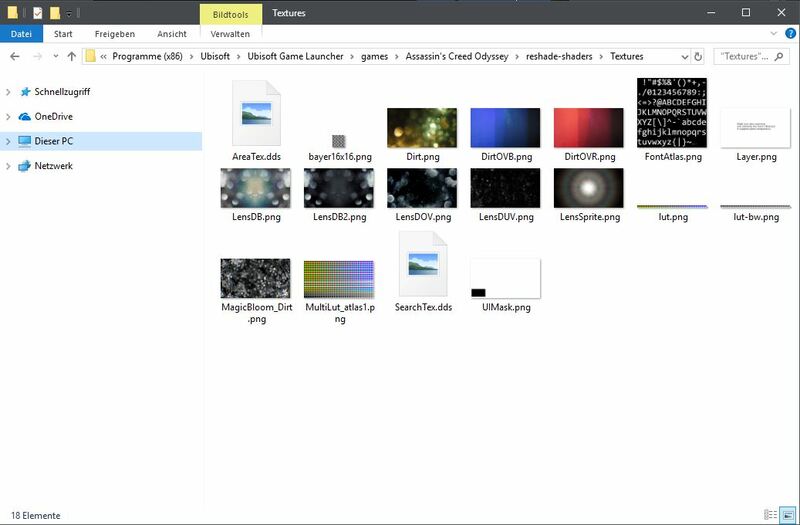 I have tried to uninstall it and tried to install an old version I still had on a folder (3.0.6) but seems it doesn't recognize shaders in my folder anymore, so it's all empty when I open the Reshade window in-game. Does anyone have the same issue ? I would really appreciate any help. Yes I have the same issue using my color correct LUT to load using LUT.fx shader or the one that displaycalgui generates. My LUT is 4096 x 64 (64 tiles of 64x64 each) - can anybody see anything obviously wrong? I've tried every permutation of isreversed and isupsidedown to no avail. LUT.fx works flawlessly in v3. There are two ways to fix this. You can either scale your LUT down to 1024x32 (which is the default size LUT.fx expects) or you tell LUT.fx the size of the used LUT. This can be done by adding fLUT_TileSizeXY=64 and fLUT_TileAmount=64 to the global preprocessor definitions. Didn't notice that you have already done this (setting fLUT_Tile* to 64). Well, the only thing that comes to mind is that the colors in your LUT are encoded the wrong way. Last Edit: 4 months 2 weeks ago by Daodan. If the modifiers have been keyed in properly (setting in left box and value in right), it looks like I'll have to stick with v3.4.1 . Could you post a link to your LUT so I can try it out and maybe see whats wrong? As I were quite impatient I re-installed 3.4.1 until I could find a solution. I looked at your replies, and something I don't understand. In my textures files, my LUT texture is 1024x32. I also checked my ReShade.ici file in the [GENERAL] section : there's no specific path for LUT, but the Effect Search path and Texture Search path, and they both correspond to the right files. ...there's no specific path for LUT, but the Effect Search path and Texture Search path, and they both correspond to the right files. 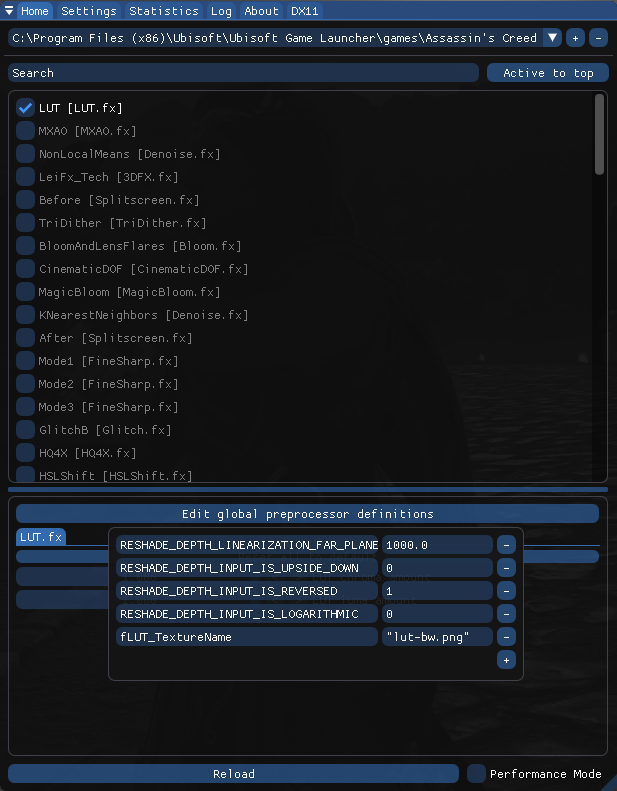 Try naming your LUT a unique name and add that to the preprocessor definitions. Then enable the LUT technique and check in the Log tab for any errors. ERROR | > Source "myLUT.png" for texture 'V__texLUT' could not be found in any of the texture search paths. you need to check if there's any error in the search paths and/or the LUT name. Last Edit: 3 months 1 day ago by Daodan. I tried it with the name "myLUT.png" like your picture and it still found it in the textures files, but there's still no effect. ERROR | > Source "lut-pink.png" for texture 'V__texLUT' could not be found in any of the texture search paths. 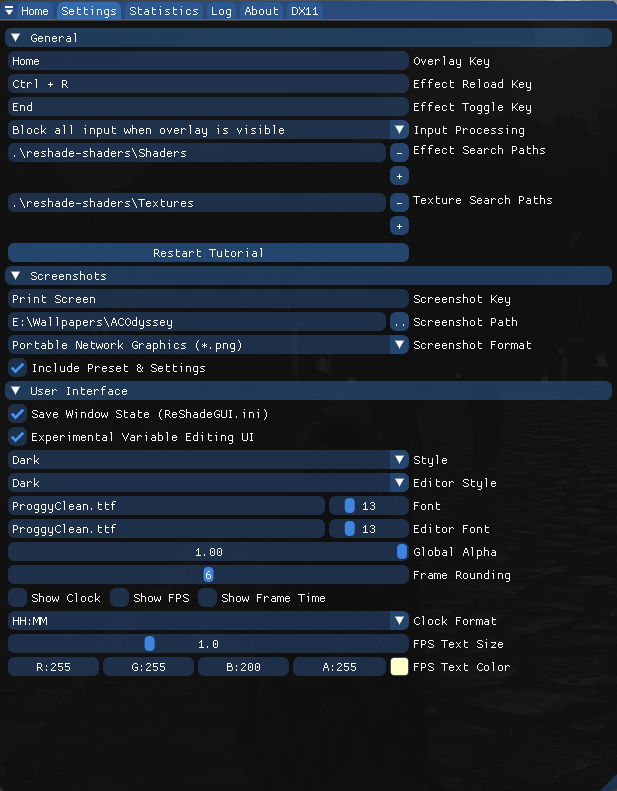 Not sure why it doesn't work for you but here's a setup with a greyscale LUT that works. I didn't have the lut-bw files so I made one based on the original one. And the thing is, it worked ? My screen became greyscale when I activated it after I changed the fLUT_Texturename to this files. But the luminosity doesn't change at all like before. 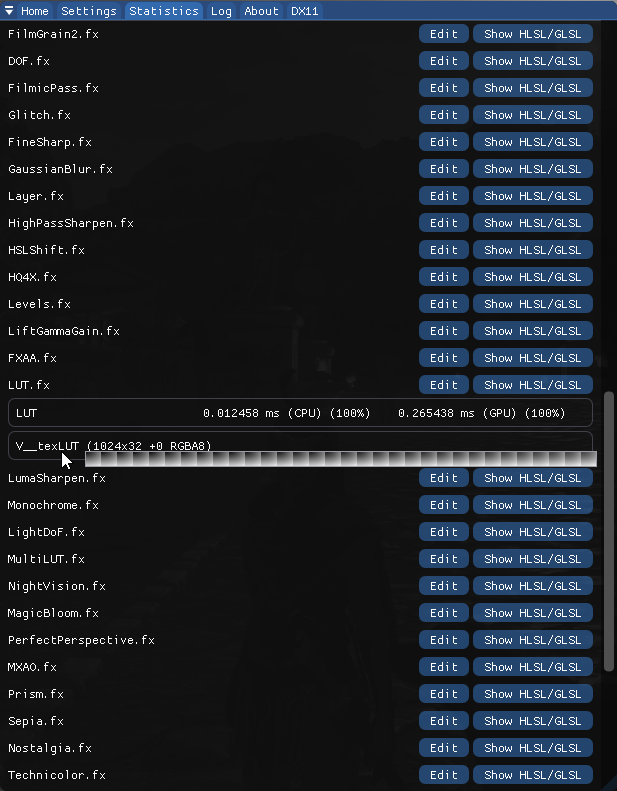 I tried to figure out the difference between 4.0.2 LUT and 3.4.1 LUT, and it seems like I had both LUT and LUTAtlas files, and the difference is made only if I have them both files available. // by Otis / Infuse Project. But if I add these lines like how there are disposed in 3.4.1 lut file, when I launch my game it says "failed to compile" or something like that. I have the same issue. It wont read anything bigger that 1024X32 without corrupting. The texLUT's "Width" and "Height" is calculated values. Modify values to equals by calculated of fLUT_TileSizeXY and fLUT_TileAmount for your created image. I did that. I used Lightroom to make my LUT. I copied what it said in that shader. Makes everything not right.